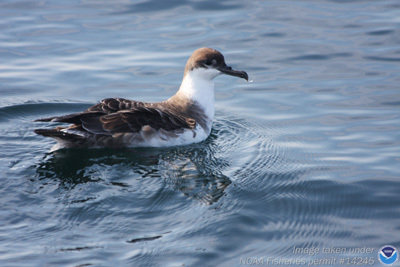 Researchers at NOAA's Stellwagen Bank National Marine Sanctuary are using satellite technology to learn more about the movements, life cycle, and feeding and foraging habits of great shearwater seabirds in the Gulf of Maine ecosystem. Scientists have attached satellite transmitters to 8 birds and are tracking their movements this summer. Track the Shearwaters: Birds were named for the funding foundations or for communities that boarder the Stellwagen Sanctuary. So pick your favorite town/bird and see where it goes! This is a map of the movements of the 10 tagged shearwaters over a 4-day period. Shearwaters are one of more than 30 species of seabirds that can be found in the sanctuary. The birds winter and nest in the southern hemisphere, usually appearing in the Gulf of Maine in April to feed. However, little is known about how they spend their time in these northern waters. David Wiley, research coordinator for Stellwagen Bank National Marine Sanctuary, said seabirds are excellent indicators of ecosystem health, including changes that may occur due to climate change. The birds can be seriously affected by alterations in their food supply, which are often dictated by water temperature, currents or other factors, he said. "In the southern Gulf of Maine, sand lance is the primary food fish for most large predators, including whales, seabirds, bluefin tuna, and other important commercial and recreational species," Wiley said. "For some reason, the numbers of this forage fish fluctuate and have been quite low over the past few years. We want to learn more about how seabirds react to changes in their primary food source and what factors cause changes in forage fish abundance." The Stellwagen research team uses satellite tags manufactured by Microwave Technology to track the movement of 8 birds throughout the summer and beyond. Researchers attach the tiny tags to the back of each bird with fine thread. The team also collects body weight as an indicator of the bird's health and condition, and blood and feather samples to study food habits. Signals from the tags have allowed scientists to plot bird movements. They can then relate the movements to oceanographic features such as water temperature, bathymetry, chlorophyll concentration, ocean fronts and other factors that might result in increased productivity or that concentrate prey. The 8 birds were named for the funding foundations or for National Parks in honor of the National Park Service's 100 year anniversary. The great shearwater (Puffinus gravis) is a gull-like seabird that is dark above and white below, with a dark cap on its head and dark coloring on the trailing part of its tail. It has a white band around its neck, a black bill and a white rump patch. It is one of the larger birds in the seabird family Procellariidae. The bird can often be seen feeding on small schooling fish in the sanctuary, often in large groups that include various gull species. Great shearwaters will glide over the wave tops with stiff outstretched wings. They breed during our winter season on Tristan da Cunha Island in the South Atlantic Ocean in large dense colonies where the female lays one white egg on open grass or in a small burrow. Northern feeding grounds range from Florida to the Labrador Sea (south of Greenland). Their migratory route is a "Great Circle," in which they move from the South Atlantic to North American waters as early as May and then on to the eastern Atlantic by late summer. The research is being led by Dr. David Wiley, research coordinator for the sanctuary, Michael Thompson sanctuary Geographer, and Brad Cabe sanctuary GIS Specialist, in collaboration with Linda Welch, US Fish and Wildlife Service seabird specialists at the Maine Coastal Islands National Wildlife Refuge, Andrew Allyn, PhD candidate at the University of Massachusetts in Amherst, Dr. Robert Ronconi, Postdoctoral Researcher, Dept. of Biology, Acadia University, Dr. Les Kaufman Dept. of Biology Boston University, Dr. Kent Hatch, Long Island University, Kevin Powers of Stellwagen Bank National Marine Sanctuary. The project is being funded thanks to the Volgenau Foundation, the Davis Foundation, and the Mudge Foundation.